Isn't this a cute little fall activity? One of the best parts is that it's a Dollar Store Score! The Dollar Store wins again! I found these super cute little mini pumpkin/squash/gourd bags in red and green. They were a perfect size to make a cute fall themed Tic-Tac-Toe game (I recently saw a large Tic-Tac-Toe game played with full sized orange and white pumpkins in a magazine, though I can't remember which one). I tasked the kids with finding sticks in the backyard. To make a Tic-Tac-Toe board, you'll need 4 like-sized sticks. Once they gathered a handful of sticks, we picked the four that were closest in size. Using some string or yarn, tie the sticks together to form your board. We used grey yarn. And there you have it! 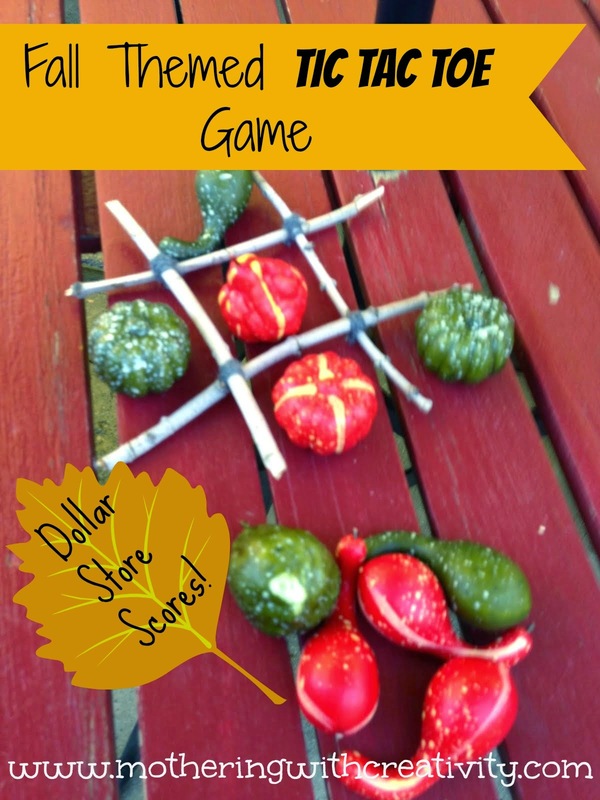 A fall themed Tic-Tac-Toe game! The kids thought this was a really fun way to play this game. Plus, they enjoyed hunting for sticks and comparing sizes of the sticks. And, of course, it's super frugal!